Jay and I arrived in Santo Domingo around 10 pm last night after a full day of travel--the first leg of which was LA to Miami with a three-hour layover filled by dinner at Shula's followed by a much-needed pedicure for me and a nap in the massage chair for Jay at the airport mini-spa. We connected with our good friend, Greg Wilborn, from Vision Trust who had flown in from Denver and the three of us boarded a packed American Airlines flight to Santo Domingo at around 7 p.m.. I was still catching up on my sleep and Jay was catching up on movies he downloaded, so the one hour and 50 minute flight from Miami to Santo Domingo truly flew by. Nelson, who heads up Vision Trust Dominicana, met us at the airport in Santo Domingo along with his son, Oscar, who came along for the ride. Oscar was completely exhausted after spending the day with a group from North Carolina who was staying at the Vision Trust mission house. They had all been playing with the children at the Remar Orphanage and Oscar was more than justified in quickly falling asleep in the car while Jay, Greg and I caught up with Nelson and got briefed on what we'd be doing the next day. With the mission house full, we were taken to the Fiesta Hotel, about ten minutes away from the mission house where we found ourselves in much different accommodations than what we were used to on our previous trips here. Staying at the mission house is always a great experience with the team building it creates, but the Fiesta is just a little bit (a lot) more luxurious. Greg let us know we were on-call for cabinet purchasing and assembling the next morning. This would complete the last of the needs for the classrooms and we were hopeful a contribution from Chain Store Age was about to clear that would allow us to pick up ten locking metal cabinets, one for each classroom, so teachers could safely store all the new supplies that had been purchased when we were last here in April. Nelson and Greg picked us up at the Fiesta the next (Friday) morning. Also with them were the Whites, Tom, Liz and their teenage son, Cutter. These good friends of Greg's from Colorado Springs, had arrived a few days earlier and were lucky to have snagged the "honeymoon suite" (the room with only 2 bunkbeds instead of 6) at the mission house. Greg told us we had the green light to buy the cabinets so we immediately had Nelson drive us over to the showroom where two already assembled cabinets were ready to be loaded onto a truck. 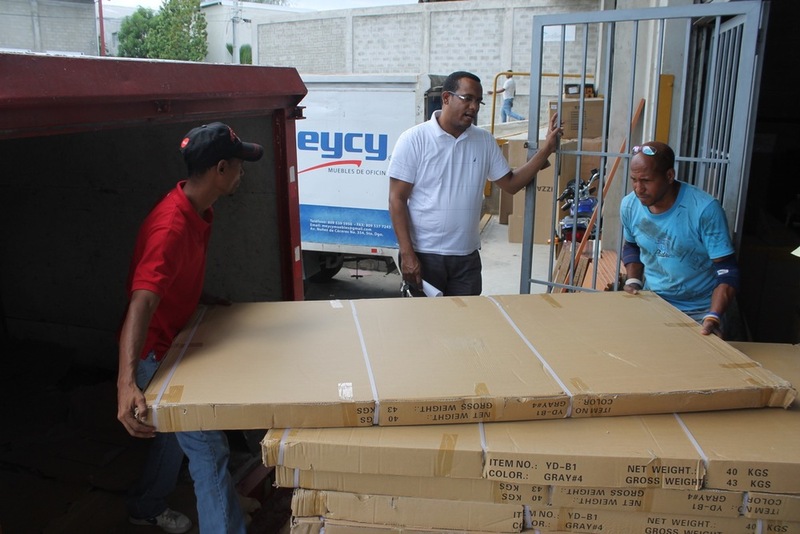 From there we followed the truck to the warehouse where the boxed-up unassembled cabinets were loaded. We followed the truck to Tia Tatiana school where the cabinets, weighing about 90 pounds each, had to be carried down the narrow street and into the school, most of them needing assembling and all of them needing to be carried up the various staircases of the school and placed in the classrooms. Thank goodness the White's were there to help! 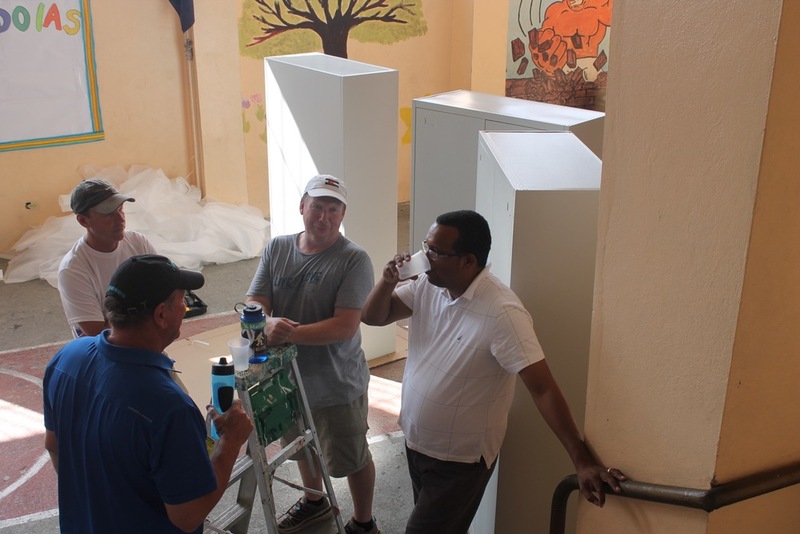 The guys sweated A LOT putting those cabinets together and we were working against a deadline of 4:30 p.m. when the parents, students and teachers were scheduled to arrive for the celebration of the newly furnished classrooms. It was about 1:30 by the time all the boxes were unloaded. While the work was going on, Jay and I snuck up to take a look at the classrooms and were so happy with what we saw. Two of the teachers had already totally set up their rooms and the new sturdy tables, colorful chairs, fresh paint and murals on the walls along with all the learning aids made all the difference from when we first saw these shabby classrooms in November 2014. We also had a videographer with us who filmed throughout the school and stayed with us to capture the most important part of the day when we all gathered on the top floor of the school that doubles as the church on Sundays. On this day we were treated as the guests of honor. But I have to say, it wasn't us...it was Nick who truly was the real guest of honor. We were shown to a table on the front stage of the open-air room and asked to sit with Greg Wilborn on one side and Evelisa, the school principal, on our other side. The table was draped with a tablecloth and adorned with a beautiful spray of flowers. Nelson spoke a few words as did Evelisa, who looked elegant, despite the August heat. Then it was our turn to speak. With Nelson translating, I told the group of 100 or so, about Nick, and the idea he had when he was 13 to help kids in the Dominican Republic by sending them used baseball equipment at the end of his last year in Little League. I told them about Nick's joy for life and his faith and I told them about how Nick was taken to heaven just a little over a year ago by a lighting strike on the beach while spending time with his friends. 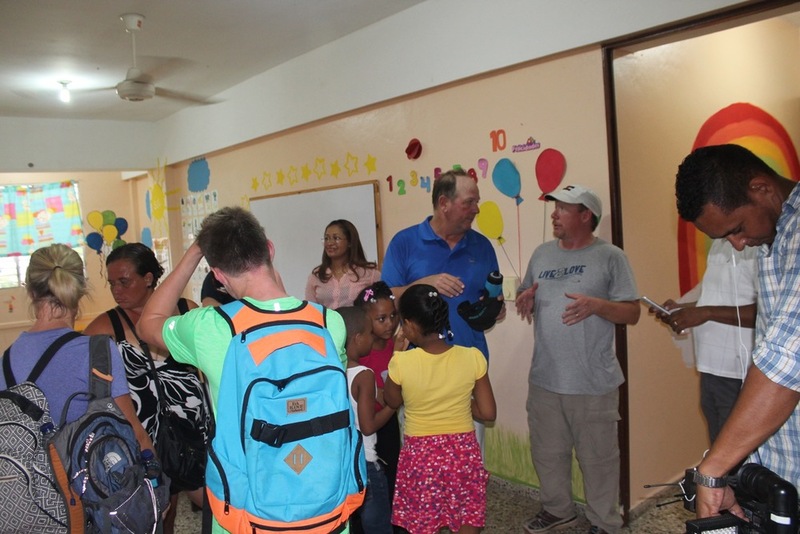 I explained that we came to the Dominican at the suggestion of Greg Buzek from Retail Orphan Initiative, a program I had come to know through my work and I said how we loved the people we met and we saw a need at the school to help the students in a way that Nick would've wanted us to. It was through the love and support of friends, family, co-workers and even strangers that we were able to accomplish the goals we set for providing the new classroom furniture and we told the group that we feel Nick's presence with us as we celebrate the completion of all the classrooms just as the new school year is about to start on August 17th. Jay wrapped up by telling his story about the young boy he met on our first trip to Santo Domingo when we were making our way through customs. An American mom with three children was trying to navigate getting them all into the ladies room with her. The boy, who was about eight years-old, wanted nothing to do with going into the ladies room and the door on the family restroom was locked. Jay offered the mom to take her son into the men's room and as they were about to walk in, Jay turned to the boy and asked, "So what's your name?" The boy looked over his shoulder and said to Jay, "Nicholas." And so, as if we needed proof, Nick was surely with us on that first journey as much as he is on this one, Jay concluded. Then several teachers and parents got up to speak and each one referenced Nick and told us how his presence will always be felt at Tia Tatiana School. One little girl of no more than four years old got on stage, took the microphone and sang "Hallelujah" and then two other little girls, identical in size with their hair arranged in identical, multi-row braids; took the stage and sang together. Nelson closed with a prayer and Jay and I headed downstairs with the videographer to position ourselves to capture the faces of parents, students and teachers as they entered one of their cheerful classrooms for the first time. A few minutes later, leading all the others down the narrow, somewhat treacherous stairs, was a woman on crutches with only one leg. We understood enough Spanish to learn that she'd been in a serious motor scooter accident (scooters are the main source of hired transportation for people that don't have cars in the Dominican Republic) and here she was attending the celebration along with her only son who was about eight years old. Everyone's reaction was so incredibly joyful as they made their way into the classroom. It was amazing to experience the gratitude and to have the opportunity to bring our story of Nick to these families who struggle with life every day. Although we know we've accomplished a huge goal with the help of so many, today also felt like a beginning where there will continue to be ways to encourage these children with their education and, as they progress, to see this school make a difference within in the entire Herrera community.